What are the Best Offside Trap Drills? What are the Best Soccer Shooting Drills? 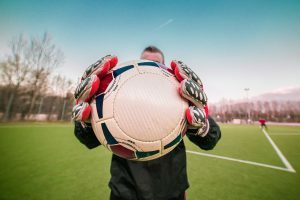 2 Why is a good soccer shooting technique important? 3 Where can I find soccer shooting drills? Any good soccer coach will have a series of soccer shooting drills that they use regularly to keep their strikers and players in top form. Ask any soccer player out there and they’ll tell you that there is no sweeter feeling in the world than scoring a goal, so helping them to improve or maintain their shooting abilities should be one of your key goals. I’ve coached in many soccer leagues around the world, both professional, amateur and for youth and adults alike, and I’ve tried many different soccer shooting drills with the teams that I’ve coached. Today I’m going to put my knowledge to good use and we’re going to look at the best soccer shooting drills that I’ve either used in the past or have found through different sources on the internet. It’s strange but the position of your knee is really important when hitting the ball. Make sure that the knee of your kicking leg is over the ball when you strike it. Why is a good soccer shooting technique important? Well, it might seem obvious but if your team can’t shoot properly then you’re going to need a lot more chances to score a goal. This puts additional pressure on the rest of the team to create these chances, and extra pressure on the defence not to concede any goals at the other end. You’ll find that the best teams in the world will win difficult games 1 – 0. They will have been under pressure in an away fixture for a large amount of the match, then the striker gets one chance and puts it in the back of the net! These are the teams that win championships, so fine tuning your shooting ability really is a key skill to have. Where can I find soccer shooting drills? Unfortunately, for you the only person who has access to the first item is myself, and these ideas are all locked away in my brain for the moment, however, the second 2 sources are easily available to you. The Epic Soccer Training System is a full course of soccer training that has been used by more than 10,000 soccer professionals to help them develop their game and has a huge range of drills, tips and techniques available in their video collection. I’ve tried many different coaching and training videos in the past and can honestly say that Matt Smiths personable and thorough style of teaching is something that is easy to follow and will help you develop your skills along the way. I’ve included one of his videos here to show you the type of content you’ll receive. In this video he talks through the basics of how to volley a soccer ball correctly. OK, so lets kick off this training session with a couple of my favourite videos, which will give you a number of drills that I'd recommend you carry out at the start of every training session. If you do this, you'll be shooting like Scholes before you know it! This is a great video with some really nice drills for you to start off your training session. This video covers 5 shooting drills where you'll learn to ​focus on accuracy, rather than power. When I was growing up I didn't have a soccer field near to me so the found the next best thing, which was a wall to practice on. This next series of shooting drills that we are going to look at are specifically for shooting whilst you are on the run. There will be many times in the game when a team mate plays a ball to you as a 1-2, or passes to you into space. Most of the time you're going to be surrounded by defenders so you need to learn to think quickly and either shoot straight away, or take another step to control the ball. Simple drill practicing a 1-2 combination with your team mate, before taking on the shot. Make sure you practice with both feet​! A ball comes over to top of the defense and you're in a one on one race with the defender to get to the ball first and shoot. In this shooting drill the attacker turns his defender, but then comes under pressure from a second defender. This is a much more realistic scenario from a real game and a great drill to refine your shooting technique. This is one of my all time favourite drills, which I use with a lot of the teams that I've coached. This really helps the players to develop ​ not just their shooting technique, but their awareness of the game. Once they've got their shot off, they can't just stand still and need to be aware that the game can continue and provide more shooting opportunities, or the need to track back and defend. As a striker in a soccer match, you're going to be chasing down through balls, like a dog chasing a stick, so you want to learn to remain calm under pressure, judge the flight and path of the ball and get a good shot off on goal. Check out this video for 3 drills where you practice running on to through balls from both around the side and over the top of the defense. In this next series of drills we focus on your reactions and the work you'll be doing within the penalty area. As a striker most of your goals aren't going to be pretty and are going to be the ones you scrape home from inside the box​, so keep on practicing these drills and you could be the 'Fox in the Box' that most clubs desperately need! Place 5 - 7 dummies in and around the 6 yard box to act as your defenders​ and feed the ball to a striker in the middle from various angles. ​We use this drill all the time in training, to really perfect the strikers timing and decision making in different scenarios. What we're looking for here is to develop the instict of the striker so they shoot and score​ without thinking about it. What we're trying to do here is create real world scenarios where the striker is receiving crosses from the wings. This shooting drill will develop his skill in choosing whether to take a touch, hit it first time or volley the ball. This drill is used with 4 defenders and 6 attackers all within the penalty box. Balls are served into the area and the idea of the drill is to shoot as often as possible, or find a quick pass and get the shot away. I like this drill as it really tightens up your strikers reflexes and gets them into the mind setting of shooting as soon as possible. Often you'll find teams guilty of trying to walk the ball into the goal. Trust me, if you're in the penalty area then 9 times out of 10 it's better to get your shot away, than trying to beat a man. ​The last thing that we're going to look at today is a couple of drills to practice your volley shooting. The ball is not always going to come to you nicely along the floor, but will be either bouncing awkwardly, or come at you in the air, when you'll need to either volley or half-volley the ball into the back of the net. Before you start to volley a ball like Zidane, you need to get use to receiving the ball in the air. This is a simple drill to help you work on your touch and get used to the feel of the ball. In this drill you'll be receiving crosses from the wing and will learn to judge the flight of the ball. The striker is fed balls from 6 different areas into the penalty box. He has to quickly learn to head, shoot or volley the ball. ​As you can see perfecting your shooting game isn't as simple as it looks as there are many different aspects that you'll need to practice. I've tried to distill my years of knowledge down into one article for you, which brings you the best of the best from the internet, and of course if you want to develop yourself fully as a soccer player then I can't recommend Epic Soccer Training highly enough. So, you've got plenty of soccer shooting drills to practice now, so remember... no excuses, go train and have fun!